I'm telling you people. I have lost the mojo for good ideas. I'm having to resort to copying others and making them my own. I must have mani block or something like that. I'm warning you, the next four posts and manis are just not up to my standards. I have no idea how to fix this. Any one out there have any ideas for me to get my awesomesauce back? The past few days, it has been thunderstorming. Personally, I love a good noisy storm. My cat Sam on the other hand, freaks out. The boy is 26 lbs of love, but when a storm comes around, he is the biggest whiniest baby in the whole world. He hides behind the couch and the wall, meowing this awful sound. I usually get up and have to pet him to get him to come out once the storm has passed. My favorite is when it wakes you up in the middle of the night with big booms! That's my all time favorite. I finally went back to work. I had not been at work for six weeks during my 'episode'. I have to say, part of me was enjoying not having to work at all. Sleeping in, watching all the daytime TV. Speaking of which, did you know there are now like four shows similar to Jerry Springer? Let's see, there is the Trisha show, Bill Cunningham and Jeremy Kyle. I guess that only makes three, but who's counting! Trisha and Jeremy hail from the UK, apparently, their shows were so awesome there, they came here. My question to my UK peeps-were they the same over there as here? With people and yelling and lie detector tests and DNA tests for who's your baby daddy stuff? I tell you, there are some nasty people on those shows. I just can't believe the people who go on these shows and tell the stuff they do. All in the name of entertainment! 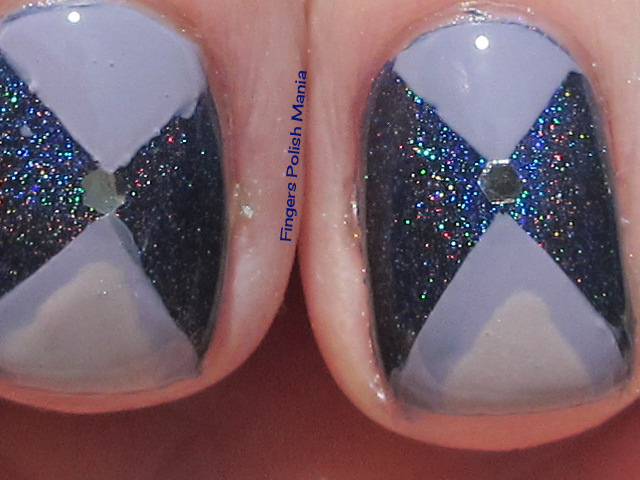 Now today's idea hails from the lovely Amy Grace at The Polished Perfectionist. If you have not seen her blog, you are truly missing a good one. Her nails and polish are always perfect. Hence the perfect name for her blog. Could I say perfect any more in one sentence? I think not! Any who, I saw this idea and decided I could try that for myself. Let's start with the silly bottle shot shall we? This is Rescue Beauty Lounge Be Humble and Forgiveness on the ends and Cirque Fascination Street in the middle. I started with the Cirque. 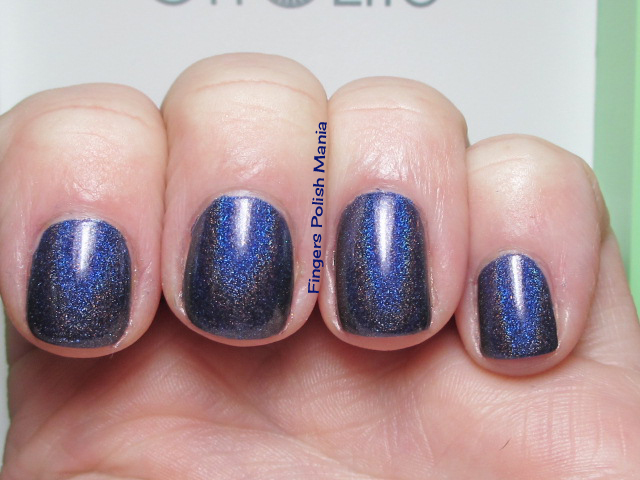 This is a gorgeous blurple holo and stunning! Here is the starting shot. Because I'm emulating Amy Grace and her perfection, I tried really hard to get this polish perfect. Even my cuticle lines are pretty nice if I say so myself! 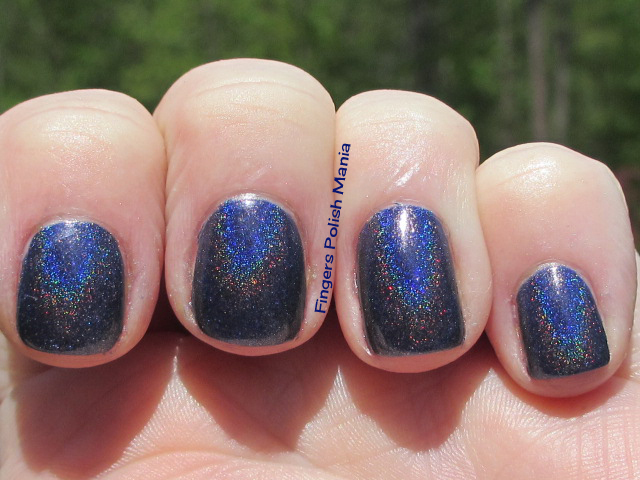 Is this not a gorgeous holo? Look at all those rainbows! Now I taped off and painted with the two purples and added a glequin in the middle. I did not take pictures of the steps, I was too engrossed. Here are the results. To finish this off, I just added my funky. Here you go. Not as pretty as Amy Grace's, but not too shabby either. I am loving this holo. Just stunning. Do you watch daytime TV too? What's your favorite? Mo You or Mo Me?